Largest STAINLESS STEEL Tool and Gadget set on Amazon: 23 Piece Set includes 1 of each: Slotted Spoon, Basting Spoon, Turner, Slotted Turner, Peeler, Pizza Cutter, Can Opener, Locking Tongs, Flat Grater/Zester, Utility Whisk, Bottle Opener, Ice Cream Scoop, Soup Ladle, Potato Masher, Spatula/Scraper (Nylon material). AUGUST 2016 UPDATE: Set NOW features 4 STAINLESS STEEL measuring cups and 4 STAINLESS STEEL measuring spoons in the following capacities: 1/8-cup, 1/4-cup, 1/2-cup and 1-cup. 1/4-teaspoon, 1/2-teaspoon, 1-teaspoon and 1-tablespoon. Set does NOT include plastic spoons and cups. 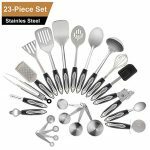 Perfect for a Gift – The ONLY fully Stainless Steel cooking utensils set on Amazon: Each piece is well constructed from sturdy, durable high grade stainless steel for great performance. 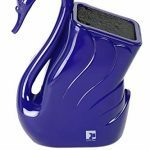 Looks, feels and performs better than Nylon, and other Non-Stick materials which melt overtime. 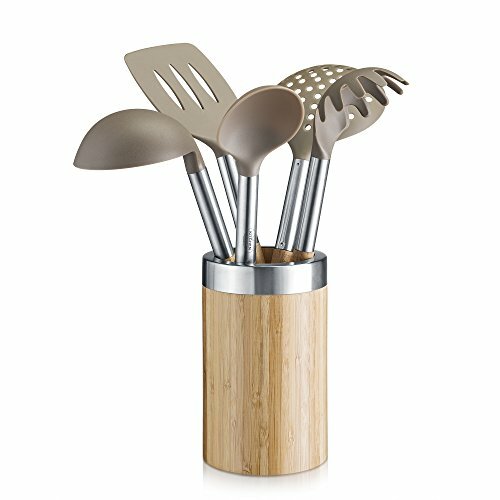 With the Chef Essential 23 Piece Utensil set you have all your essential kitchen tools in quick reach. 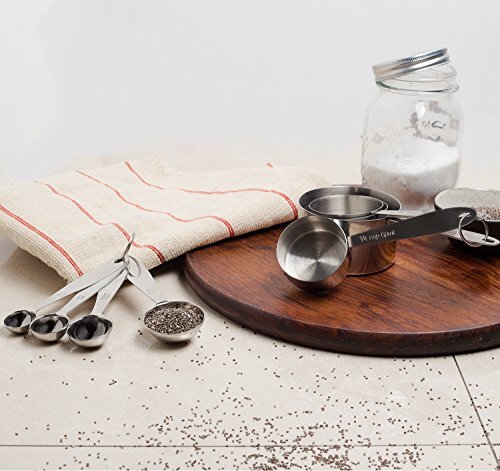 The perfect everyday kitchen Tool Set. 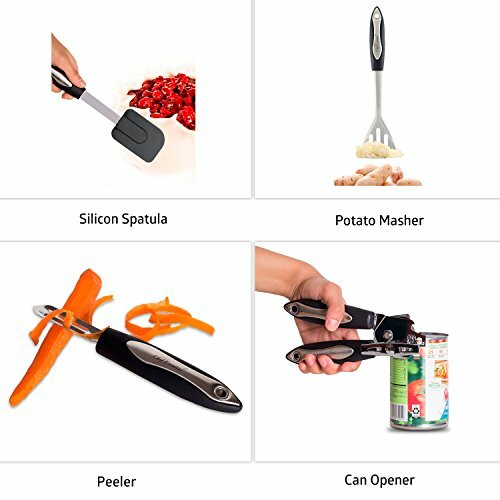 With our slim-lined, space efficient tools and gadgets. holds our Nylon Flexible Turner, 12″ Tongs with Nylon Heads, Nylon Square Turner, Nylon Spoon, Nylon Slotted Spoon, Grater, Swivel Peeler, Ice Cream Scoop, Potato Masher, Soft-handled Can Opener, 11″ Balloon Whisk, Silicone Spatula, Meat Tenderizer and a 4″ Pizza Wheel. Whether it’s your first set of kitchen tools or enhancing your current set. 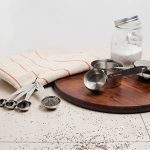 Filled with a big variety including tongs that can be used as asparagus tongs, salad tongs, Chef Essential’s 23 Piece Everyday Kitchen Tool Set will bring value, function and style to any kitchen for your everyday kitchen tasks. 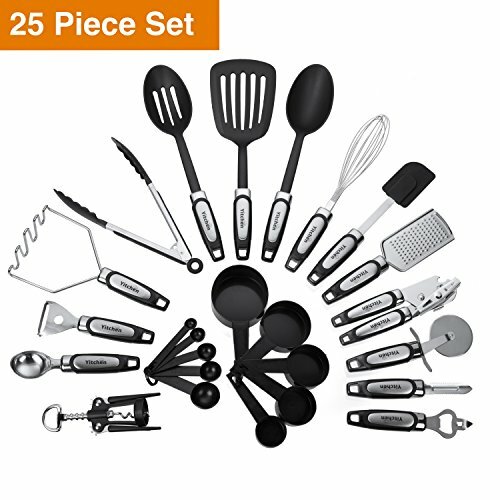 Ultimate set to tackle all your culinary needs.You will not find a better price for this kind of set! 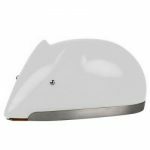 Safe and Convenient – Tools can be used for all your cookware needs (be gentle with non stick cookware) and are heat resistant up to 450 degrees. 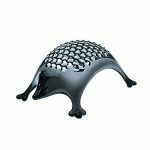 Dishwasher safe for fast and easy cleanup – Top rack recommended – Lifetime Warranty from the Manufacturer on all 23 Utensils. 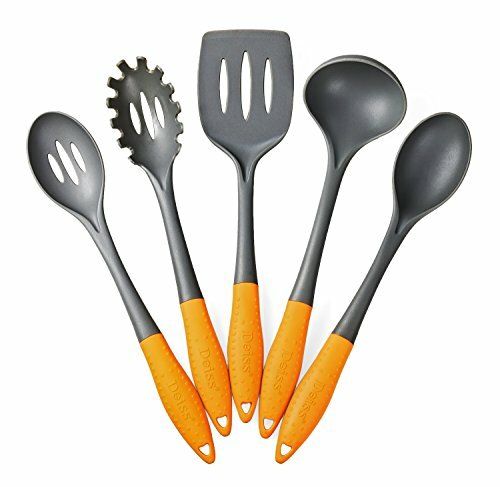 Kitchen Maestro, Nylon Utensil Set with Acacia Grips and Stainless Steel Handles – Set of 6 Utensils and 1 Storage Crock.